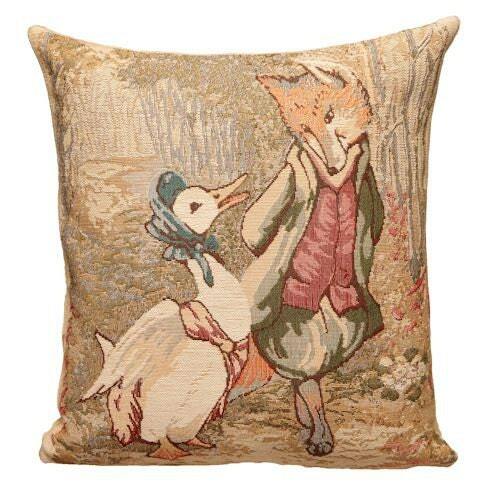 This tapestry cushion is part of a line of ten cushions showing characters of the famous Tale of Peter Rabbit by Helen Beatrix Potter (28 July 1866 – 22 December 1943) who was an English author, illustrator, natural scientist, and conservationist best known for her imaginative children's books featuring animals such as those in The Tale of Peter Rabbit, which celebrated the British landscape and country life. Jemima is based on a real duck that lived at Hill Top. In the tale, Jemima wants to hatch her own eggs so tries to find a secret nesting place away from the farm, but runs into the foxy-whiskered gentleman who ‘helps’ her to find a suitable place.Published in 1908, The Tale of Jemima Puddle-Duck features Beatrix Potter’s Hill Top farm, and her surroundings. This cushion is woven on a jacquard loom. Tapestry design is a craft that only a few master. The designer starts from a high resolution image, which he scans and then completely reworks it until it is ready for weaving. Averagely, the "cleaning up" of an image takes between 12 and 16 hours. Respect !